Every day we see so many ads. Brands and ads are literally everywhere with us from when we wake up until when we fall asleep, and for many of us, brands, products and experiences even accompany us in our sleep. Would this drive anyone to buy/investigate further/visit a website? This past week I came across three very good campaigns that ticked the boxes. The sound of seven or so synchronised Spanish guitars during your lunch break is appealing to say the least. These players drew a crowd and in the middle of a chilly day, really made you think how nice it would be in a balmy Spanish summer from next month, flying Emirates’ new services from Sydney to Barcelona or Lisbon, of course. It couldn’t have been a better day for it. With the air crisp and the skies drawn, the tents looked solemn and morose. What a way to make you stop and think. 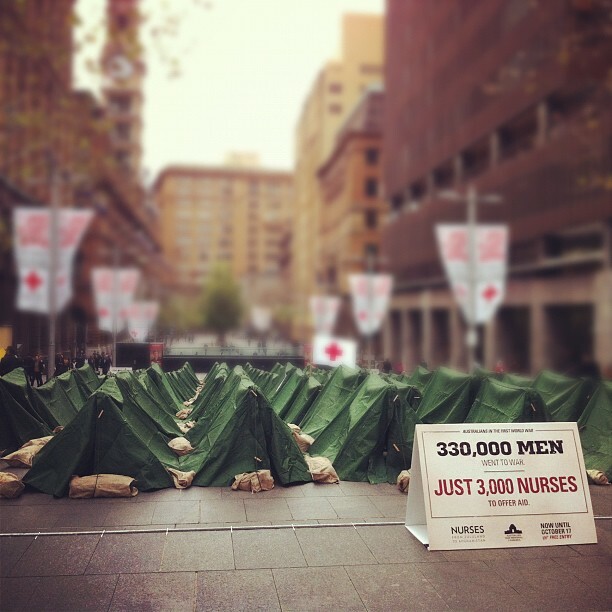 This experiential marketing campaign was there to promote the Australian War Memorial’s latest exhibition, called Nurses: from Zululand to Afghanistan. Have you seen any ads or campaigns that caught your eye recently?